The area is naturally very wet with high rainfall and occasional flash floods. 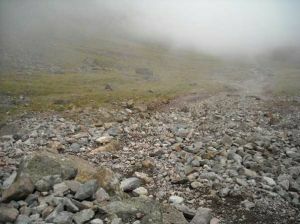 The path is on the North side of the col between Scafell and Scafell Pike and so is often shaded. This, combined with large numbers of people using the path over the years, has led to a 300m long erosion scar. 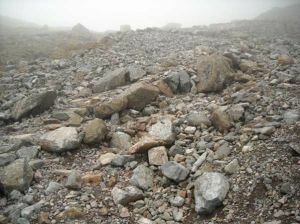 Repair work was carried out in the early 1990s but has now been buried under mobile scree. Re-align the path on a more user-friendly route using stone pitching. Carry out extensive work to improve drainage. Re-vegetate the erosion scar. 300 bags of stone. The majority of this will be recycled from the previous pitched path. Some additional stone may be helicoptered in from nearby. The scar will be revegetated using material from the line of the new path and some seed.